Patio Place offers Lake Forest residential and commercial customers the best value on brand name patio furniture, outdoor cushions, patio umbrellas, grills, barbecues, fire pits, bar stools, gas logs, fire glass, and more. In business for over 25 years, we've furnished thousands of Orange County terraces, patios, decks, verandas, and other outdoor areas. Over the years, we've developed long-standing relationships with the industry's finest manufacturers, such as Patio Renaissance, NorthCape, Fire Magic, Treasure Garden, Gensun, Alumont, and. For this reason, when they prepare to launch a new line, they contact us first to negotiate low prices on their older collections and models. With great deals and a huge selection of new pieces and closeout buys, we can accommodate the needs and budgets of nearly any Lake Forest client. We can also save our Lake Forest customers money with our lasting repairs. Available repair services include barbeque parts replacement, outdoor furniture frame refinishing, custom replacement cushion and pillow fabrication, patio chair reslinging, umbrella rib replacement, and umbrella recovering and restringing. We also offer convenient, same-day delivery service, and will haul away your old patio furniture at no additional charge. Patio Place is open seven days a week and located at 845 Baker Street in Costa Mesa (between Bristol and Bear). Visit us today and we'll help you transform your Lake Forest outdoor spaces into gorgeous, outdoor living areas. 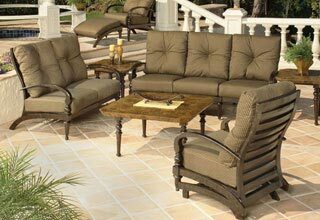 We offer the best prices on our entire selection of brand name patio furniture, including bistro tables, console tables, dining tables, end tables, patio dining sets, patio lounge sets, loveseats, anthem deep seating, benches, chaise lounges, sectionals, ottomans, swings, and more. Those in Lake Forest can find great deals on our entire collection of extruded aluminum, cast aluminum, and wicker patio furniture lines. We also offer a wide selection of standard and custom-made replacement outdoor pillows and cushions. Our friendly staff will provide you with honest, expert advice for our entire outdoor furniture inventory and can help you to find budget-friendly pieces to match your decor. Call today to learn more. Patio Place sells fire pits and bar stools from Hanamint, Alumont, and other industry-leading brands. 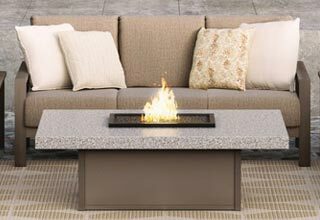 Sturdy, stylish, and long-lasting, our quality fire pits and fire tables are available to those in Lake Forest in a diverse range of heights, sizes, shapes, and styles. Our bar stools are also available in a number of designs, and can feature cushions, decorative designs, swivel design, foot rests, arm rests, and more. To view our entire selection of fire pits and bar stools, visit today. Purchased at rock-bottom prices from leading manufacturers, we provide Lake Forest with high-quality, brand name patio umbrellas for great prices. 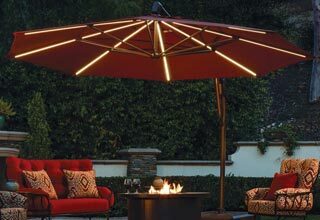 We pride ourselves on delivering superior customer service and offer honest, expert recommendations for all our patio umbrellas, including our auto tilt umbrellas, easy track umbrellas, push to tilt umbrellas, cantilever umbrellas, side post umbrellas, and umbrellas with lights, as well as our umbrella bases and decorative umbrella lights. We can even customize your new or existing patio umbrella with a business name or logo. Call or visit us today to learn more. Visit us for the best deals on brand name barbecues, grills, gas logs, and more. We offer those in Lake Forest Fire Magic barbecues and grills in various sizes, as well as common BBQ island replacement parts, such as access doors, range hoods, kegerators, sinks, faucets, fridges, lights, warmers, and more. Our ceramic gas logs come in vented and vent free models, and can enhance all your existing or new fireplaces and fire pits. We can also deliver and install most common barbecue parts, and hook up barbecues and gas logs to your gas line. We use only the best outdoor fabrics for our patio furniture and umbrella repairs, including umbrella recovers, sling replacement, and outdoor cushion fabrication. We use fabrics from Phifer, Sunbrella, and original manufacturers, providing our Lake Forest clients with hundreds of fabric options to choose from. These fabrics are available in multiple styles, colors, and patterns; and are warrantied for years against fading and damage. With so many fabrics to choose from, we have options to suit every style and budget. We can cover patio umbrellas of any size, as well as fabricate replacement outdoor cushions and pillows to your exact specifications (or recreate existing designs). We can even stitch in zippers for easy cleaning and add padding to replacement patio chair slings and straps. These fabrics are also great for protecting your patio furniture and other outdoor equipment from future damage, which is why we also use them for our custom-made covers. 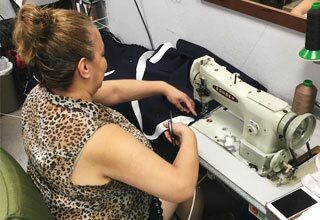 With quality fabrics, skilled workmanship, and low prices, we offer our Lake Forest clients an excellent return on their investment. Call today to learn more.